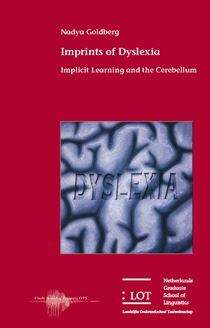 Imprints of Dyslexia : Implicit Learning and the Cerebellum Nadya Goldberg Cover text This dissertation assesses the manifestations of developmental dyslexia in behavior , cognition and neuroanatomy as predicted by the procedural deficit hypothesis . According to the theory , a dysfunction in the cortico - cerebellar network responsible for procedural learning in both the motor and the language domain causes impoverished implicit motor and language learning abilities and eventually difficulties with language and motor skills in dyslexics . The study described here was conducted with dyslexic adults and consisted of three parts , the neuropsychological , the cognitive and the neuroanatomical . In the neuropsychological part the language and the motor symptoms of dyslexia were examined . The cognitive part mainly addressed the implicit learning abilities studied with the help of the artificial language learning and the serial reaction time paradigms . The neurolanatomical part investigated the participants â cerebellar volume by means of structural MRI . Differences between people with and without dyslexia on these three levels as well as associations within and between the levels were explored . This dissertation is of interest to researchers working on dyslexia as well as to those studying memory and learning mechanisms .